The clouds are not just over California this time around, as the storm called Devildriver is on the forecast. Bringing their 7th album packed full of their signature groove metal and an extra fist full of aggression. The lineup has been modified since their last album, Winter Kills, but in no way has that slowed or taken anything away. 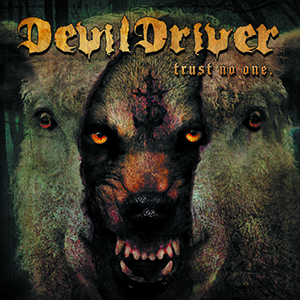 In fact, we are presented with one of the finest Devildriver albums to date. Trust No One is kicked off in high gear with Testimony Of Truth. Using its signature sounding guitars paired with Dez’s aggressive yet catchy vocals it really sets the tone perfectly for whats to follow. 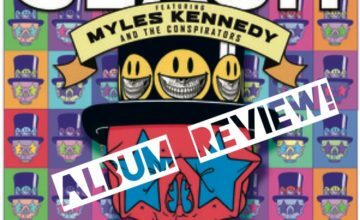 This is an album filled top to bottom with enormous riffs, fist pumping beats and some of the best vocals that we’ve seen Dez lay down. Bad Deeds keeps things moving along and manages to crank up the tempo that is certain to open up circle pits with ease. Up next, My Night Sky takes a moment and offers us a breather here slowing the tempo down and relying more on the lyrics to carry it. The chorus has been stuck in my head since first hearing it, which is always a very good sign! The anger level gets cranked to 11 for This Deception. I just gotta say whoever pissed off Dez enough for him to write this, is first you better run and secondly thank you. This track is pure metal perfection! One detail that I want to call attention to on this album is the screams that are unleashed by frontman Dez Fafara. 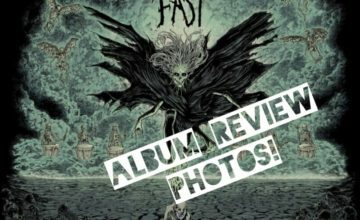 They are on a whole new level this album and are down right brutal, as displayed on Above It All. At this point of the album we are introduced to the first single off the album, Daybreak. I know I cant be the only one that has flashbacks to Motley Crue’s Kickstart My Heart when this first kicks in. Don’t let that fool you though, there is no glam rock going on here. Just pure in your face metal. If you haven’t heard the track yet you can listen to it down below. These last 4 tracks are where I feel the album really shows its strengths, showcasing perfect blends of technicality and brutality. Trust No One is one of my personal favorites. This song has a little bit of everything going on, you get shredding guitars and relentless drumming paired with some aggressive lyrics. There are so many layers to this song that it will take a couple listens to really take it all in. Remember those brutal screams i mentioned earlier? Feeling Ungodly is where they are fully unleashed on the masses. I will not lie, when I was first listening to this track I got goosebumps. I am hoping that this track finds its way onto the bands setlist as I can only imagine how powerful it will sound in a live setting. If you’re look for a straight punch to the mouth track then Retribution is what you’re looking for. This track pulls back a lot of the flash and fancy guitar work and pummels you relentlessly for 4 minutes. It’s heavy, its groovy, its Devildriver baby! This brings us to the finale and what better way to close things out than with a love song? That’s right For What It’s Worth is a track Dez penned for his wife, but don’t worry they haven’t gone soft and cuddly on us. Its serves as a great outro to what has been a fantastic album. 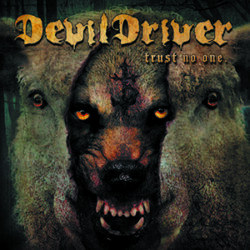 Devildriver proves with Trust No One that bands don’t have to fade away and become weaker as time goes by, in fact they seem to be the opposite and continue to evolve and strengthen with each passing release. Trust No One fits very well into the bands catalog and in my opinion is easily in their top 3 albums. All 10 tracks flow and gel perfectly together yet can each stand on their own. 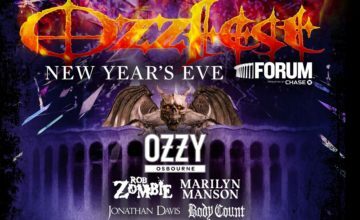 The new band members each bring a new element to the band to help user in a new era of Devildriver while not changing a formula that has worked well to this point. Packed full of 100% pure aggression and groove, Trust No One is definitely a metal album you can’t pass on.